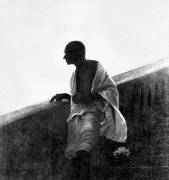 Painting of Mahatma Gandhi, c. 1931. Painting of Mahatma Gandhi with a Harijan boy. Painting by Nanda of a flute player, Tithal, 30 May 1937. Painting of Mahatma Gandhi and his wife Kasturba, c. 1939. Painting of a war scene, c. 1940. 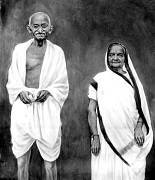 Painting of Mahatma Gandhi and his wife Kasturba, c. 1940. Painting of Mahatma Gandhi, Sardar Vallabhbhai Patel and Jawaharlal Nehru, c. 1940. Painting of Mahatma Gandhi, c. 1942. Painting of Kasturba Gandhi, c. 1942. Painting of Mahatma Gandhi, c. 1945. 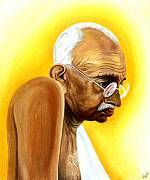 Painting by Dipti of Mahatma Gandhi, c. 1945.